With its natural beauty and unparalleled durability, Authentic NATURE STONE® Brand Flooring provides homeowners pride and peace of mind. NATURE STONE® Brand Flooring provides everything homeowners need to give NATURE STONE® Brand Flooring that new appearance or to repair any damaged area. In certain severe circumstances, like outdoor applications in extreme weather conditions, periodic maintenance will help keep NATURE STONE® Brand Flooring looking as beautiful as the day it was installed. Authentic NATURE STONE® Brand Flooring also offers complete professional services to help keep it looking like new. Authentic NATURE STONE® Brand Flooring provides two ways for you to maintain the like-new appearance of your stone and epoxy floor. Most regular cleaning and maintenance can be accomplished by the homeowner with little time, effort and cost. To restore the shine to Authentic NATURE STONE® Brand Flooring, we offer our specially formulated, patent-pending protective top coat that’s easy to apply. 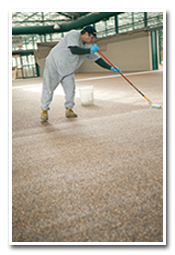 The surface of the NATURE STONE® Brand Flooring should be cleaned prior to the application of the top coat. CALL 1-855-758-9092 to purchase Authentic NATURE STONE® Brand Flooring protective top coat kits. Most homeowners prefer to repair their own Authentic NATURE STONE® Brand Flooring rather than scheduling the professional Authentic NATURE STONE® Brand Flooring repair service. By doing the repair themselves, homeowners can complete the repair quickly, avoiding scheduling a service appointment having to pay for a service call and repair service. CALL 1-855-758-9092 to purchase easy-to-use Authentic NATURE STONE® Brand Flooring flooring repair kits. 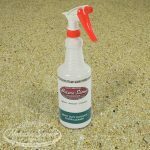 There are any number of ways to clean NATURE STONE® Brand Flooring that is installed inside the home. 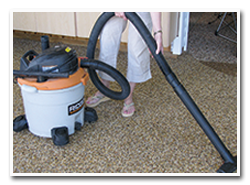 Use a vacuum for everyday cleaning of loose dust and debris. For heavy duty cleaning of spills and stuck-on grime, use one of our specially-formulated cleaning products in combination with a steam vacuum or shop vac. Garage and outdoor Authentic NATURE STONE® Brand Flooring can be cleaned using our cleaning products, which are carefully formulated to protect the finish on your epoxy stone floor. For homeowners who would prefer professional services for repair, regular maintenance and periodic cleaning, Authentic NATURE STONE® Brand Flooring offers a complete line of service offerings. To restore the shine to Authentic NATURE STONE® Brand Flooring, a specially formulated, patent-pending protective top coat is applied that will restore the original shine and appearance. The service includes a thorough cleaning of the floor prior to the top coat being applied. CALL 1-855-758-9092 to schedule a top coat application. Authentic NATURE STONE® Brand Flooring will provide all inspection and repair services of NATURE STONE® Brand Flooring. The service includes the use of color-matched stones, if necessary, to match the floor being repaired, and the same epoxy mixture as used in the initial installation. This assures that the floor will look as close as possible to the original appearance and maintain the inherent durability. CALL 1-855-758-9092 to schedule an inspection and repair services. Authentic NATURE STONE® Brand Flooring provides professional cleaning services. A deep-cleaning will be performed that extracts dirt and grime that has penetrated the porous surface of the floor. This cleaning technique provides an excellent way to thoroughly clean the floor. The process is suitable for indoor, garage and outdoor NATURE STONE® Brand Flooring. CALL 1-855-758-9092 to schedule professional cleaning services.